For lean-back wireless control of your laptop even when you’re connecting it to your TV. 10 meter (33 feet) Wireless Range: You can turn up the volume of a YouTube video, pause your vacation slideshow or tweet about the movie you just downloaded all without getting up from the couch. Large 3.5 inch Built-in Touchpad: A large 3.5-inch, built-in touchpad makes vertical scrolling intuitive. And multi-touch navigation makes it easier than ever to point and scroll your way through the Web. Touch Power: A large, built-in touchpad with multi-touch navigation lets you point and scroll your way around the Web. Plug and Play Simplicity: Setup couldn’t be easier you simply plug the tiny wireless receiver into a USB port and enjoy. Even the hot keys work right out of the box without software. No cords, software or hassles. 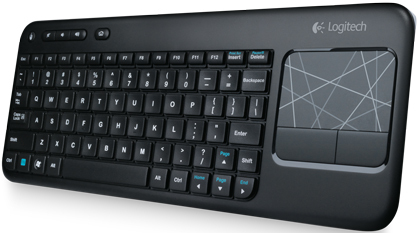 Logitech Unifying Receiver: The tiny receiver stays in your laptop. Plus, you can easily add a compatible wireless mouse, keyboard or number pad without the hassle of multiple USB receivers. Comfortable Quite Typing: Whether you’re surfing the Web or e-mailing a friend, typing is just plain easy with sleek, low-profile keys that feel good and barely make a sound. 12 Month Battery Life: You can go a full year doing the things you love without battery hassles. An on/off switch helps you save power when you’re not using the keyboard. Advanced 2.4 GHz wireless: So you can work or play in more places like your comfy couch the long-range wireless connection virtually eliminates delays, dropouts and interference. 128-bit AES Encryption: It helps protect your information by encrypting data transfer between the keyboard and receiver with one of the highest levels of data encryption available. Easy-To-Read Keys: The bold, bright white characters make the keys easier to read in your living room. Sleek and Compact Design: It saves space without compromising on comfort and looks good, too, thanks to the clean lines and a touch of color and pattern on the touchpad. Media Hot Keys: Mute, volume up, volume down and a Home button help you do the things you do most instantly. Vertical Storage: The keyboard stands vertically for easy storage when living room space is limited.